Are you like one of the millions of Americans that is afraid of going to the dentist? If you’re like most, you know the importance of regular dental visits, but for whatever reason, you just can’t seem to get over the thoughts of what sitting in the dentist’s chair means. Well, thanks to advancements in dental technology, there’s absolutely NO REASONS to fear a trip to the dentist! You see, with a technique called sedation dentistry, your next trip to the dentist’s office could seem more like a trip to the day spa. That’s right, a trip to the spa! Now, because sedation dentistry isn’t very well known, we’ve put together a special consumer guide designed to help you understand exactly what sedation dentistry is and how it can help you get the critical dental care you need (and deserve! ), all without the fear and anxiety normally associated with a trip to the dentist. Simply enter your Name and Email address in the form below then click on ‘Submit’ and your free report PLUS $365 coupon will be on it’s way. 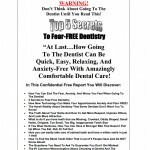 Dr. Sekulic has completed the extensive study required to safely offer sedation dentistry to the many dental-phobics in the Hamilton, OH area,he is licensed by the State of Ohio to provide, IV Sedation, Oral Sedation and Nitrous Oxide sedation and he has already calmed the fears of many patients just like you. And now you have an opportunity to experience just how anxiety-free your next trip to the dentist could be! Again, simply complete the form above or contact us today at (513) 896-1573.